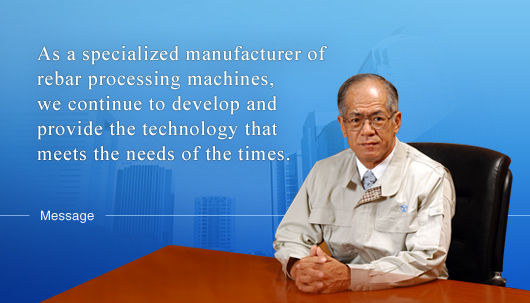 About TOYO | TOYO KENSETSU KOHKI CO., LTD. , manufacturer of rebar processing machine, rebar cutter, rebar bender. It already passed more than half a century since we started our business as a specialized manufacturer of rebar processing machines. We are extremely grateful for your continued support so far. History of rebar processing machines is also history of us TOYO. We have been endeavoring all together not only to develop and provide the technology of the needs of the times but to respond to various needs. The level of the required themes has been raised to such as increasing power, automation, systematization, unmanned operation, realization of more comfortable workplace, etc. The tasks assigned to us as a pioneer of industry have been making its hurdle higher with the times. We have been accomplishing these tasks one by one and at the same time the said fact has been growing strong spirit to create the way to the future in the mind of all of our staff members. The 21st century cannot be said by any means to be an easy era for even an enterprise having long history. On the contrary, we consider it to be the era requiring more trials, figure out errors and more efforts than ever before. Taking great care of communication with our clients, we will make a fresh start for creation of required “Technology”, acceptable “Products” and trustworthy “Enterprise” and for creation of new TOYO. We sincerely ask for your continued patronage and encouragement. Thank you very much. We will continue to be an enterprise needed by the society by anticipating the society’s needs and tackling the new themes. We are determined to contribute to the society by pursuing characteristics and progress of company staff members. We deem it our mission to undertake the development of the rebar processing industries that support country and urban building by responding to their confidence. Any questions about rebar processing, please leave everything to us. You can procure the related facilities and equipment from us. We have all kinds of products relating to rebar processing such as portable rebar processing tools, work tables, carrier devices, cranes, other tools, etc.